Focusing on free crochet patterns and sharing my projects along the way. This advertising service is crucial to keeping all of my patterns offered for free. 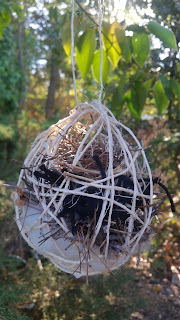 Supply the birds in your area with some nesting materials. 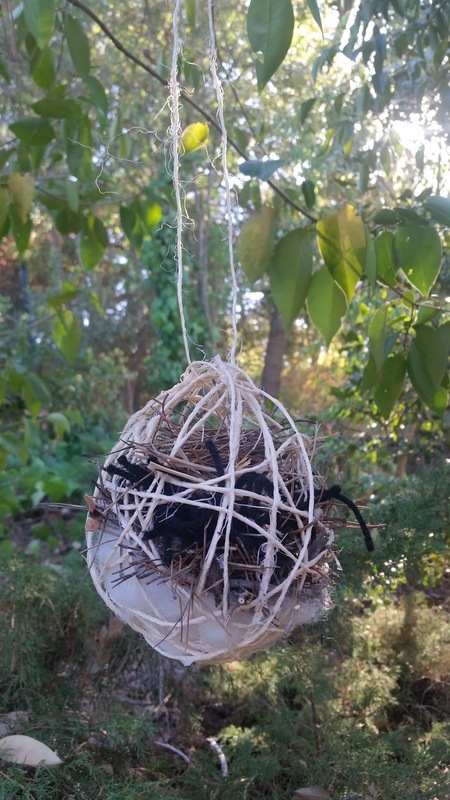 You can encourage the birds to build their nests in or around your yard. Birds don't really need our help and can make due on their own. But in the suburban land of manicured lawns and well kept yards there may not be as many materials laying around for them as there are in more rural areas. So it cant hurt to help. I was trying to figure out ideas for extra scrap yarn when I saw people online mentioning putting it out for birds. 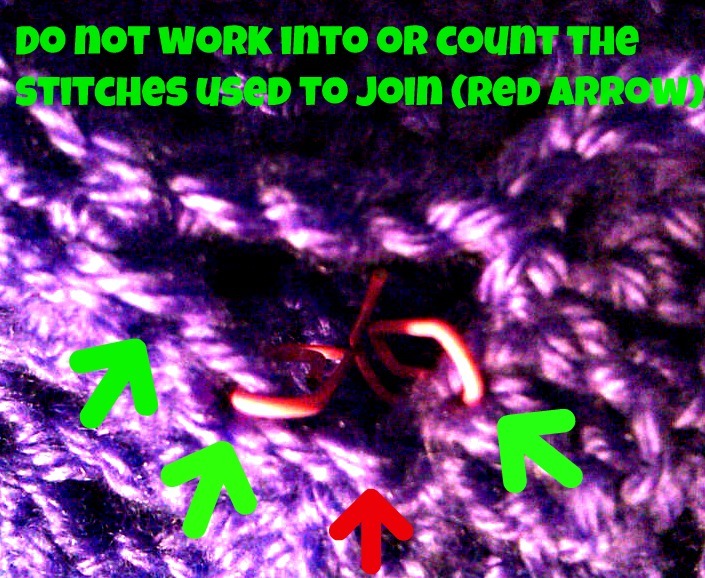 So I checked online to see how to go about doing that and I found some crochet/knit forums were discussing it and saying its probably not a good idea. That they could possibly get tangled in the yarn and basically saying don't do it. But I had heard of people doing this before so I looked into it further. I found multiple bird lovers or bird watching sites that were all for it. As long as the scraps are cut up into small bits that are less than 2 inches in length and natural fibers are best. The humane society even listed it on their website for nesting materials. So after seeing all of that I decided to go ahead with making one. 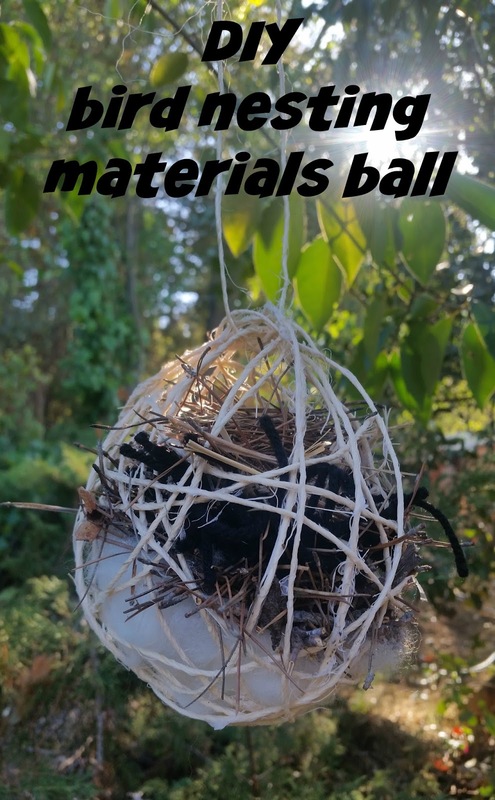 Your bird nesting material can be made up of many different items that you probably have laying around. There are also some items that should not go in them. 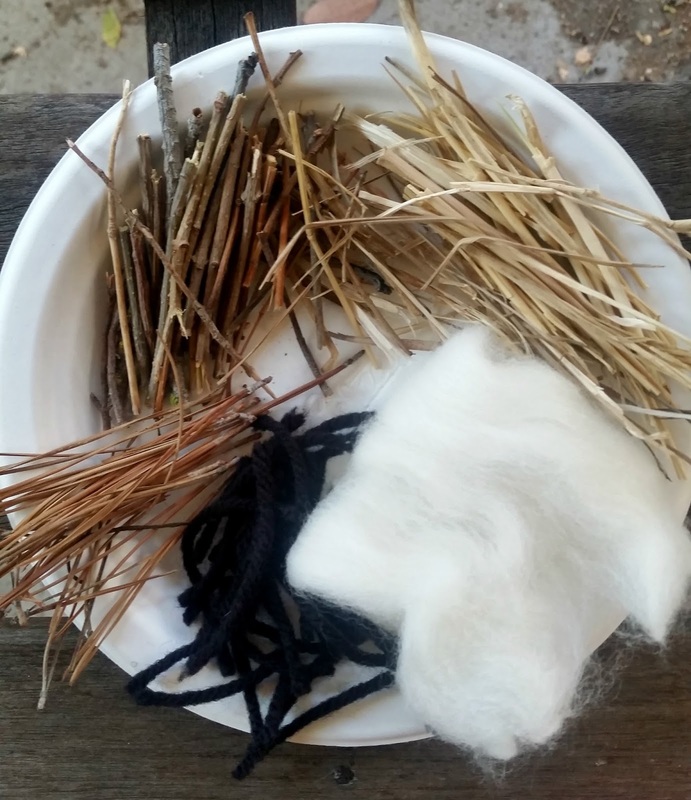 Here are some articles about birds nesting material, from The Humane Society and Wild Bird Watching. 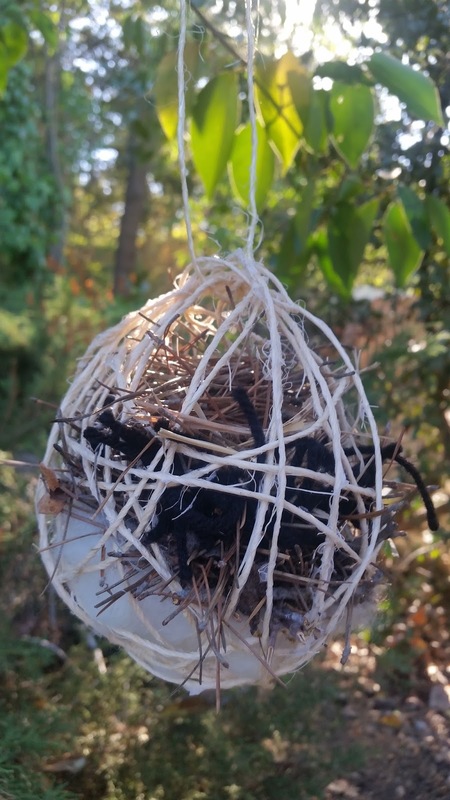 You can find premade bundles of nesting material but, why pay for that when you can DIY. Mix those all up. The mix should be runny but still somewhat thick. 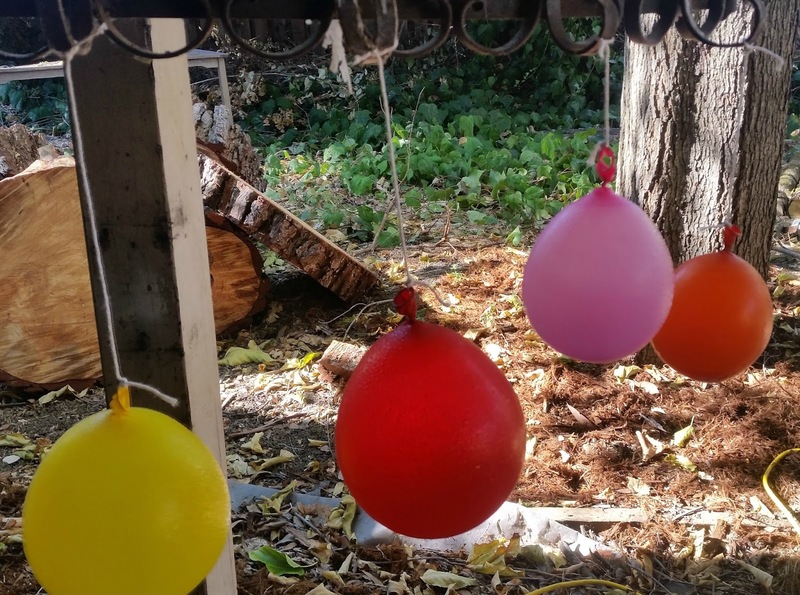 Next, figure out a place to secure your balloon. You have to hang it. I poked a little hole in the end of my balloon so I could run some string through it to hang it. 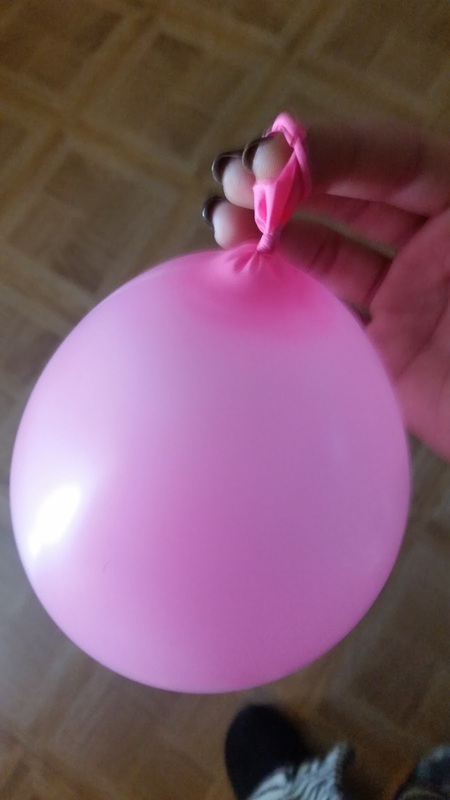 Then lather it up with petroleum jelly so everything wont get stuck to the balloon (cause that's no fun). Prepare your twine by running it through the mix. You can either just let it run through the mix or cut the amount you think you will need and toss it all in the mix. Make sure not to get it tangled up because that will slow you down. I cut mine and tossed it in so I was sure it would get fully saturated. You're ready to get started creating your sphere! Get ready for very messy hands! Have a damp rag nearby or a clear path to a sink because your hands will have the gluey mess all over them. 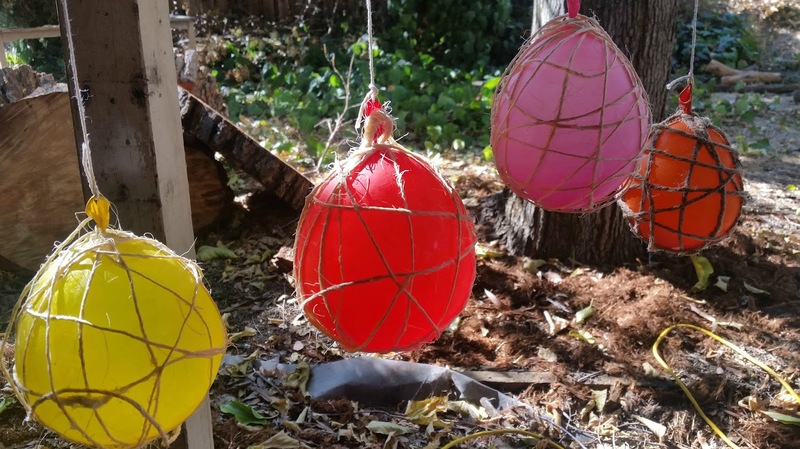 Wrap the twine around the balloon. Remember you will have to fit your fingers in there and stuff thing inside so don't go crazy with wrapping. Once your done let that dry overnight. Come back to it the next day and pop that balloon. Little specks of dried glue may fly off when you pop it so be prepared for that. Personally, I'm a wuss and never just pop it, I do the wimpy move and cut a small slit and slowly let the air out. Either way works. But more power to you if you're tough and can handle to pop it without flinching or blinking. There may be little died pieces of the glue mix on the sphere just pick those off. If there is a lot grab an old toothbrush and gently rub them off. Now we are ready to fill it up! Gather your materials and gently stuff them into the sphere. Keep in mind that this is a functional yet decorative piece for your yard so don't just stuff it in there willy nillly. Take some time and make it look nice. I stuffed mine with pine needles, twigs, yarn scraps and some roving merino wool. Now that you've got it all loaded up its time to go hang it. I took a piece of extra twine and slipped it through one of the parts on the sphere and tied it around a branch. You're all done! Now sit back and admire your wonderful bird nesting material ball thingy. Isn't it lovely?! I just love the look of it and knowing your helping those adorable little birds feels great! Baby shampoo isnt just for babies!! Why I love baby shampoo..
Ohh baby shampoo, how I love you so. I'm glad I sparked your interest. Baby shampoo is the only shampoo I use, I love it. Let me explain why.. I don't wash my hair everyday (you're not really supposed to) and when you go 2-3 days without washing your hair it gets a little oily. You have that oily buildup so what do we as women do? Spray dry shampoo on it and add to the gunk on our head. Genius right? So when you finally decide that you are gross and you need to wash your hair you must lather rinse and repeat to get that oil and dry shampoo out of your hair. Well, if you're like me you will notice that it still looks a big gunky. Even after washing twice. There would be many days that 'first day hair' looked like 'second day hair' which is so frustrating. I'm clean. Why don't I look it?! Yuck! Well I decided to turn to my good friend Google for advice. I found many salon products meant to get rid of the oils and buildup left in your hair due to hair spray or dry shampoo. I thought, great! I'll just get one of those, easy. Well, those products cost about $30. If you're like me than that is not something I'm willing to do. Maybe if it was $20, but $30, that's a big hell no. So I turned to my friend Google again for advice. I found a few forums of women claiming that baby shampoo provided the same benefits as those expensive build up busting salon shampoos. Voila! I found my answer! So I went down to CVS and picked up a bottle for around $5. Gotta love that price! Immediately after the first wash I felt a difference in my hair. I had so much volume, I'm guessing because that gunk wasn't holding it down. It was bouncy and I just couldn't help but touch it all day. At first when I started using baby shampoo it was only every other time I washed it. Going between my regular shampoo and the baby one. But it didn't take long before I was just using the baby shampoo every time. About 7 bottles later and I'm still using it! I recommended it to friends and family. My mom swapped her expensive salon shampoo for it and hasn't looked back. She gets her hair dyed so I warned her that it may not be safe for colored hair. But she and I haven't noticed a difference with it pulling the color out or making it fade. Also, my mom swears by washing her face with shampoo. Super weird, I know. But she does look really young for her age so I'm not gonna call her crazy. But anyways, I've started doing it too since its no tears shampoo. Might as well.I have really sensitive skin so for me it was like a light bulb went off in my head. If its made for a baby, chances are its gentle enough to use on my face. Sure enough, it doesn't irritate the sensitive skin around my eyes at all!! So if you have a sensitive face, try it out. If you have a dry scalp or are prone to dandruff im not sure how well this will work for you. You could add a couple drops or tea tree oil to the shampoo and that will moisturize your scalp. The do make a 'moisturizing baby shampoo' I have yet to try it but I'm sure that would be perfect for anyone with a dry scalp but oily hair. 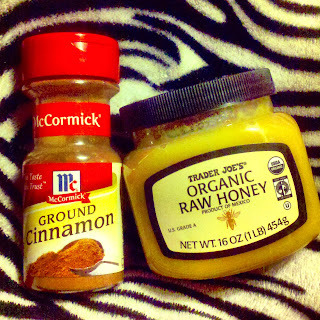 Honey & Cinnamon Hair Mask. Lighten and Condition! Hey all! It's been forever since I've posted anything. Life has been crazy and yada, yada, ya. This is totally not crochet related but I just had to share it! Anyways let's get to the point. Dirty dishwater blondes this is for you. Brunettes can add some color too. So about 2 years ago I decided to swear off hair dye forever (well probably not forever but you get what I mean) so I did one last round of dye and did an ombre thing to my hair so I could just let my roots grow out and rock that look. But recently I have gotten really bored with my hair and want a change so bad. But I refuse to dye it. So I went to my good friend Google and searched for some natural ways to lighten your hair. Sure enough I found this remedy that not only lightens your hair but conditions it and makes it smell delicious all from stuff that you may have lying around in your home. To good to be true right? I was a bit skeptical but I figured why not give it a try and I was amazed with the results! Mind you my hair is a dirty blonde and takes well to coloring of any kind. When I used to bleach it, it would take very quickly so depending on your hair you nay not are results for just one use. My research online lead me to believe that I wouldn't really see any results after just one use, but I did. So it all depends on your hair. I'm not going to get super technical. You can Google it and find out more if you would like. Basically, honey contains a small amount of peroxide. Mixing it with the cinnamon boosts the lightening process and helps add the golden tones. Honey is a great conditioner. It locks in the moisture. Raw honey - Don't just use the kind from the bear bottle. Apparently it is important to use the raw kind. Once I went to make this mixture I found that raw honey is much more thick than the other kind of honey which helps keep it thick and creamy. They sell raw honey at any health food store or probably even the regular grocery store. Ground cinnamon - You might as well buy the big container of it because you want you use quite a bit of it. Conditioner - Just your regular conditioner. Plastic bag or saran wrap - To wrap around your head after you apply it. Bandana - Not crucial but helpful to wrap around your head you catch any drips. I didn't measure when I mixed it all together, just eyeball it. How much you need depends on how thick and long your hair is. Try to go for equal parts honey and conditioner. So you can make changes to this mixture. I found a few different "recipes" shall we call them..? I didn't try any of these...yet. Take a few spoonfuls of honey and pop it into the bowl. Work it around with a spoon to get it softened up and mixed with the cinnamon. If it's really cold where you are run a blow dryer on it for a minute and that will help soften it. Add some conditioner. Roughly equal to the amount of honey you used. Stir it all up. This WILL be messy. You have been warned. Your hair must be clean (no product) and damp. Not sopping wet but not super dry. Brush through your hair and separate it into 2 or 3 parts depending on how thick your hair is you may need more. Dip your hands into that ooey-gooey delicious smelling mess and slather it on. Make sure you're generous with it and really cover your hair. After you're done icing your head twist your hair up in a bun. Wrap the bag or saran wrap around it to keep the mess contained. If you have a bandana roll it up and wrap it around so it will catch any pesky drips that try to roll down your neck. Now we wait. I slept with it on which is what I recommend. I put it on a bit before bed since I never actually get 8 hours of sleep. Take a towel and lay it over your pillow to avoid your pillowcase getting ruined. I shift a lot in my sleep so when I woke up my bag and bandana were a bit askew so I was grateful that I thought to lay down the towel. If you aren't planning on sleeping with it on then leave it on for at least 6 hours. You've done your time and now you get to rinse it out. When you go to wash it be prepared because it's going to take a lot of washing. The funny thing is, initially I thought, honey is so sticky it must be so hard to get out of your hair. But no, it was the cinnamon that really hung on there. Rinse it well, very well. Then start shampooing. What I did was wash thoroughly twice then put some conditioner on it so I could comb through it a bit. Rinsed, shampooed again and conditioned. Inspect it to make sure you don't see any specks of cinnamon. Take a deep breath and soak in that lovely smell. Yup, that's coming from you. Voila! Like I said, you may or may not see a difference from just one use. You need to do this multiple times for it to really take effect. I plan on doing it again in a week or so. But for now I just can't get enough of how soft it feels and how great it smells! 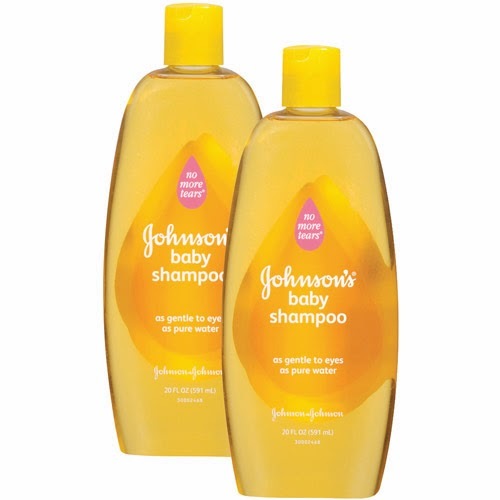 If you love inexpensive beauty tricks be sure to check out why I love baby shampoo! I love the texture of the seed stitch! This case is designed to fit a digital camera, you can very easily add onto the chain to make it larger if needed. 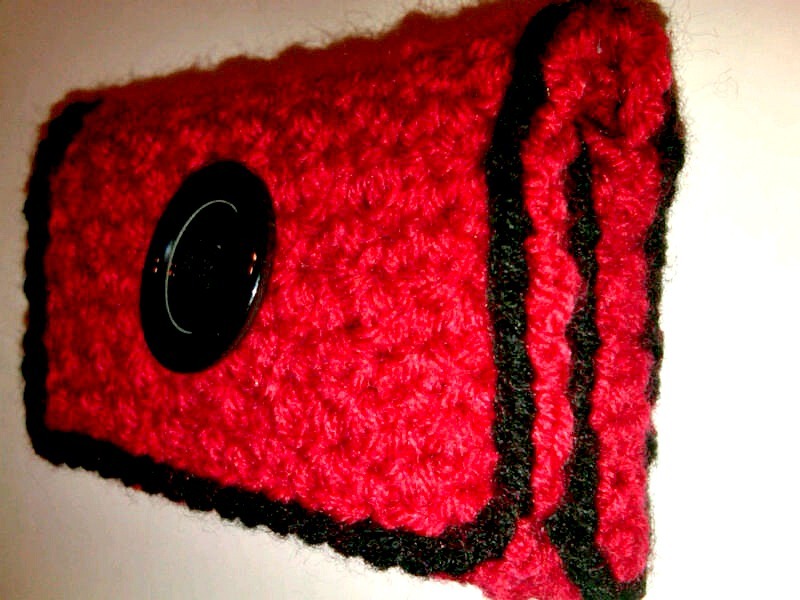 It uses "seed stitch" so it has a great texture! My camera is about 4 inches wide x 2 1/2 inches tall x about 3/4 of an inch thick. I know not all cameras are the same exact size so I left as little extra room for different sizes to still fit comfortably. 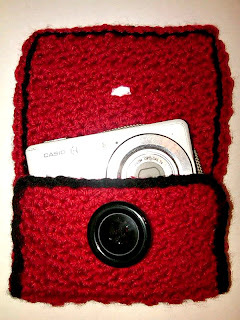 Ravelry page for this case - add it to your library! The case is comes out to be 5 inches wide and 3 1/2 inches tall. Ravelry page for this clutch - add it to your library! Attach the sides together with whatever method you prefer, I simply whip stitched the sides and then flipped it inside out to hide the seams. When you attach the sides you want to leave one row untouched, basically leave one row that is not stitches together. 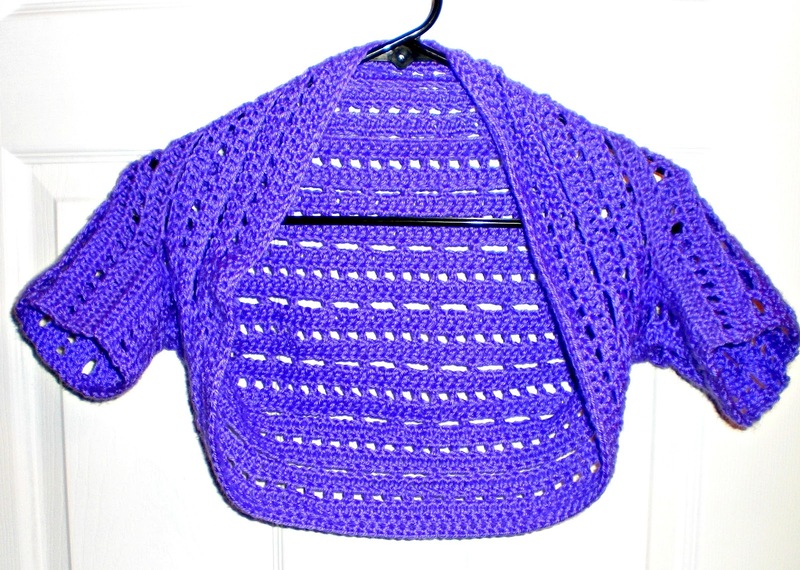 This is a super easy bolero/shrug that you can adjust to fit any size! I love figuring out simple, fast and most of all easy patterns so I'm so excited to share this with you all! It is full of eyelets so it is light and airy, I love eyelets and I keep trying to figure out more fun ways to use them. Figure out how far down your arm you want the shrug to go, measure from that spot across your shoulders to the same spot on your other arm. That is how wide you need to make your rectangle. Measure around your arm in that same spot, this will be how tall to make the rectangle. You may want to add a half inch for comfort and stretch. 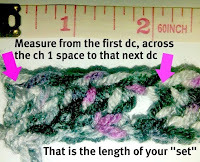 If your yarn is not one that gives easily or stretches than you may want to add 1 inch. If you follow this pattern exactly than your piece will be about 25 inches long and fit a teen or petite/small woman (around 100 lbs or less). But you can make it in any size with adjustments. 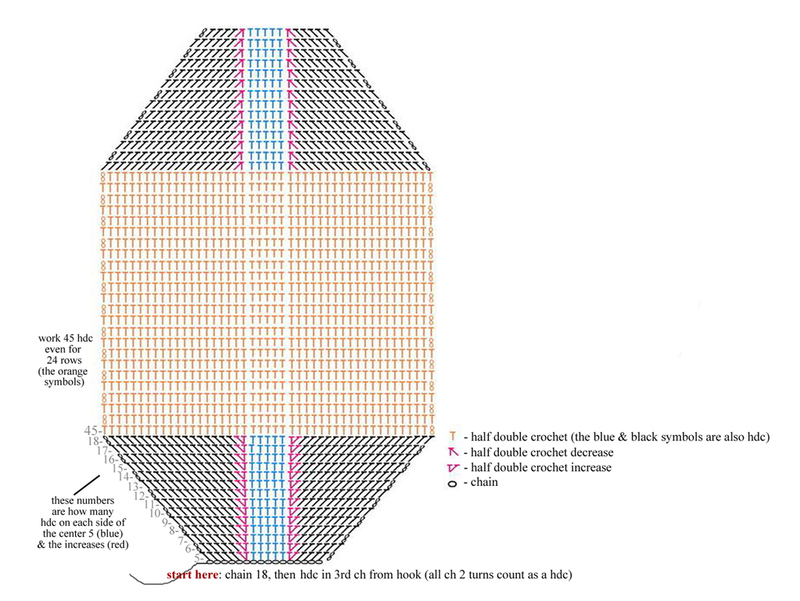 To adjust the size you want the number of chains to be a multiple of 4, then add 5 to that amount. The great thing about this pattern is its so easy to adjust to any size!! 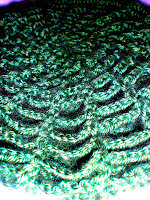 Ravelry page for his bolero - add it to your library! Repeat rows 2-5 until piece reaches height needed according to your measurements but you want row 2 & 3 to be the last rows worked! Don't end with row 4 & 5 otherwise when you go to work the band your pattern won't match up. You want to fasten off but leave a long tail to sew the sleeves, go ahead and weave in the end from the very beginning to get it out of your way. 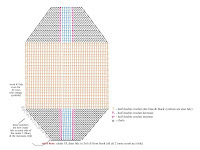 I suggest sewing together 16 stitches inward for each sleeve but you can adjust that easily if needed for size but just make sure that you work in even numbers for the stitch count! Please adjust it if needed instead of completing it and commenting that it was too tight. I want you to love your project! Only do 12 if that seems more comfortable. It all depends on your fit and how far down your arm you measured from. 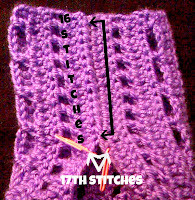 Count 16 stitches (or less) starting at the corner (corner counts as the first stitch) and mark the 17th stitch, do the same for all the edges. 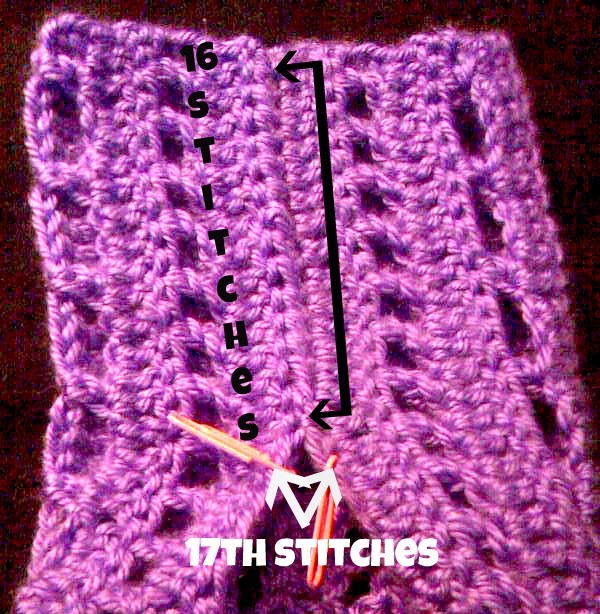 Sew together those 16 stitches and stop at the marked 17th stitch. Attach yarn to the other end and join the other 16 stitches to form the other sleeve. Attach the yarn into the marked stitch (it doesn't really matter exactly which one you start from) you will now be working in rounds. It's best to keep the markers in the stitches for the very first round so you don't accidentally work into the stitches right next to it that you used to join/sew the sides. You will be working the same pattern as before but since you will be working in rounds so it starts and ends slightly different than working in rows. But you still do not work into the very first st. Heavily inspired by the Flower Square by Beata Basik but wanting a smaller square with less holes I decided why not come up with my own. 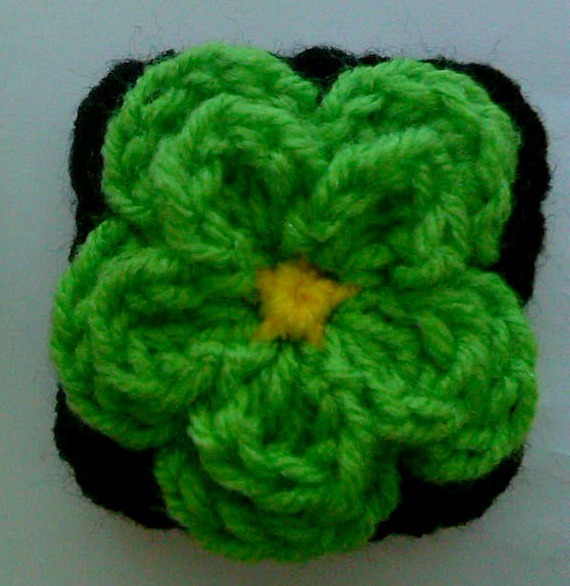 I made a mash up of the flower square by taking the idea of the flower square but using a smaller flower and changing it up a bit. Since my intentions are to use this square for purses/clutches I wanted to make sure it didn't have a bunch of holes where you would be able to see the lining. 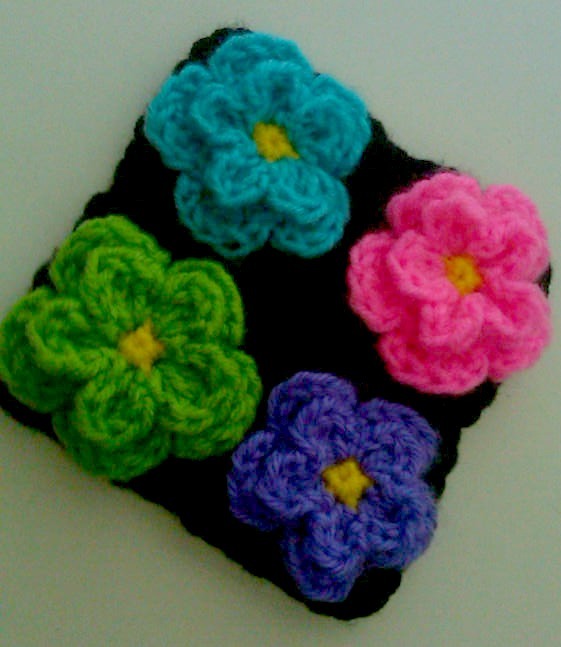 For my squares I used 3 colors, center, petals and base. You don't have to use a different color for the center but included in the pattern is when to do the color changes. 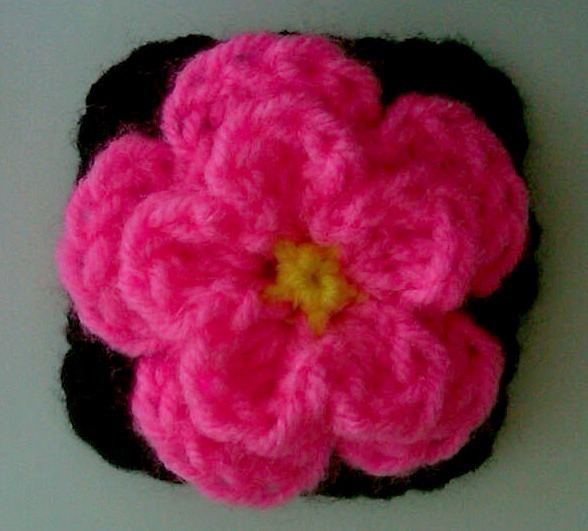 Ravelry Page for this Cute Little Flower Square - Add it to your library! 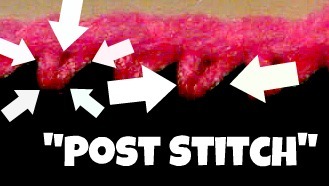 post stitches = the "bottom" of the stitch, the part that is wrapped around the previous row. Do not work the dc for the petals tightly!! You will get frustrated later when you have to work into the post stitches of the dc! 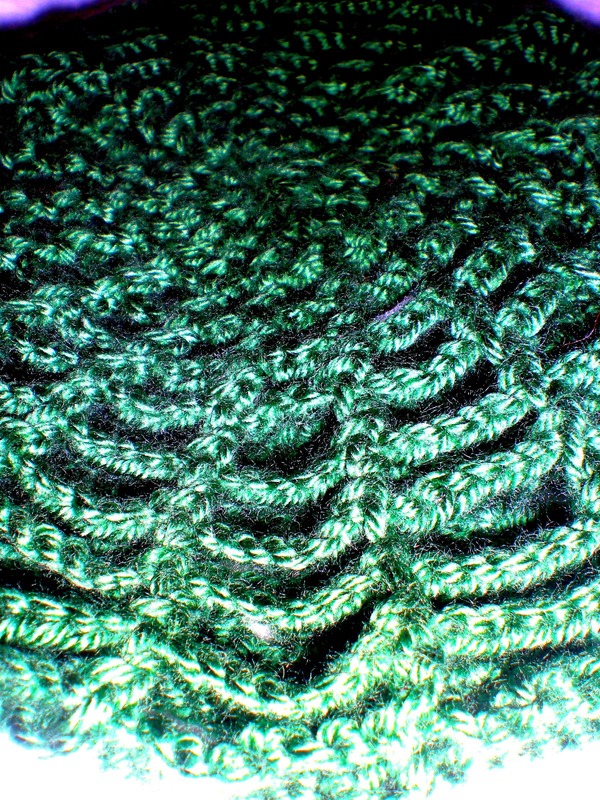 I love the look of the crocodile stitch and using it has been on my to do list for a while. 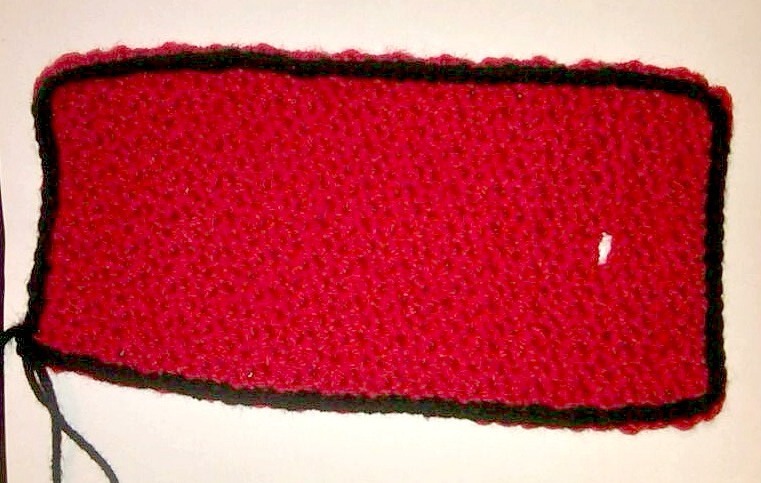 It comes out really thick so I know that it wouldn't be good for any spring or summertime garments so I got to thinking how I could use this awesome stitch on an accessory. I have seen the crocodile stitch used on some really cool pieces but unfortunately (with a few exceptions) they are patterns that you have to buy. 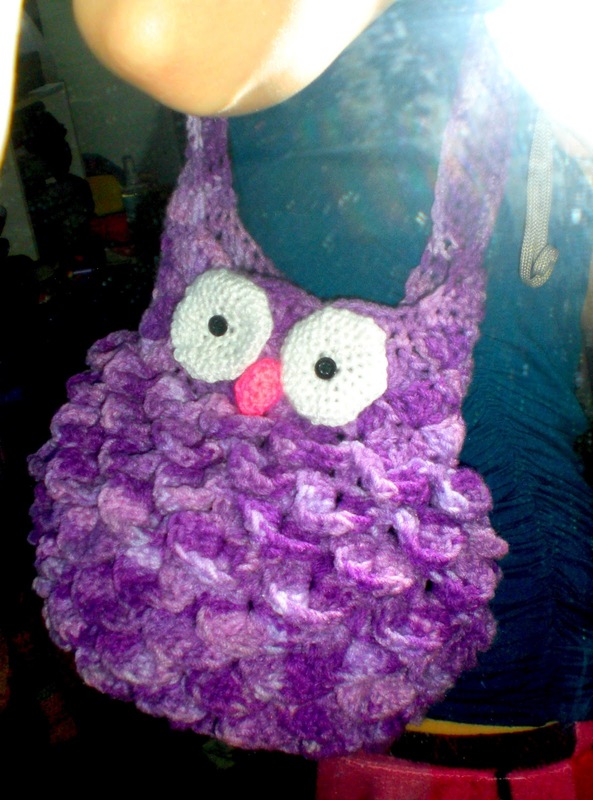 I love owls, anything with owls on it always catches my eye. 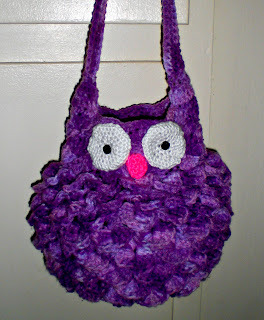 I've had the Crocodile Stitch Owl in my Ravelry library for a while as inspiration since it's a pattern that you have to buy. I love the idea of the scales (as I call them) to be used as feathers....genius! 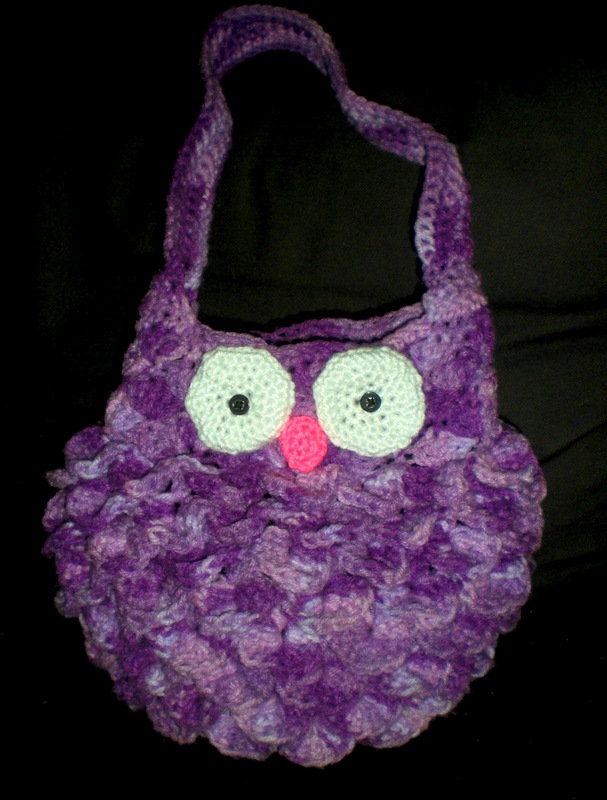 So as I usually do I sat down with some paper a pen and a few inspirational pictures and got to figuring out how I could make a purse that looks like an owl out of this stitch. It was more difficult than I had imagined and I felt like giving up but when I set my mind to something I'm not gonna stop. I made it up and pulled it all out way too many times to count, I could have probably made 5 purses in the time I wasted frogging this project over and over...but it was worth it in the end when it all started working the way I wanted it to. 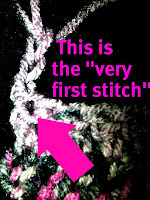 This purse uses the crocodile stitch, if you are not familiar with this stitch and have never worked it before than take a moment and watch this video I also found this picture tutorial very helpful. Work up a strip, take it apart and work it up again, practice makes perfect. It will save you a lot frustration later down the road when you are working up the pattern and saying wtf does she mean?! There is not much worse than having to frog rows on your piece because you realized you made a mistake it the first few rows. I cannot stress enough that you need to know how to do the crocodile stitch before you start this pattern....you will get very lost and confused if not. I noticed that while working this up there are many times where if you just stopped at that point you could make something else, when it is still flat I realized that it would make a really really cool hotpad! I'm going to get some cotton yarn and make one! Also once it starts to become a bowl I realized that it would make a cool bowl for yarn balls or other random nick-knacks. Especially if you use a stiffer yarn (like cotton) it would make a great bowl! I wrote in into the pattern where you would want to stop working the steps, for the hotpad but if you wish to make a bowl you have to decide where you would want to stop. 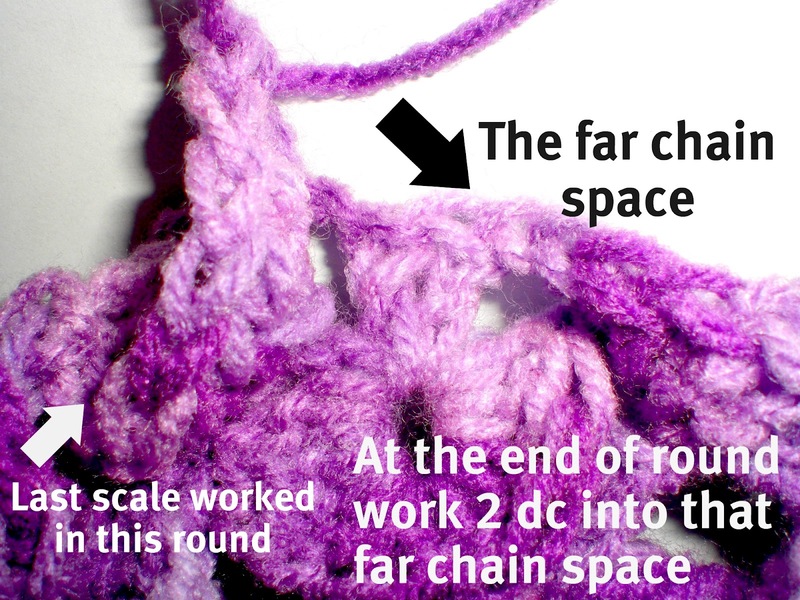 Round 4: Ch 1, * 2 dc in the chain space between the scale and the 2 dc, ch 2 work 2 dc into the other chain space between the scale and dc, ch 2, dc into the hole in center of the scale, ch 2 * Sl st into the top of the last dc in the last scale to join. 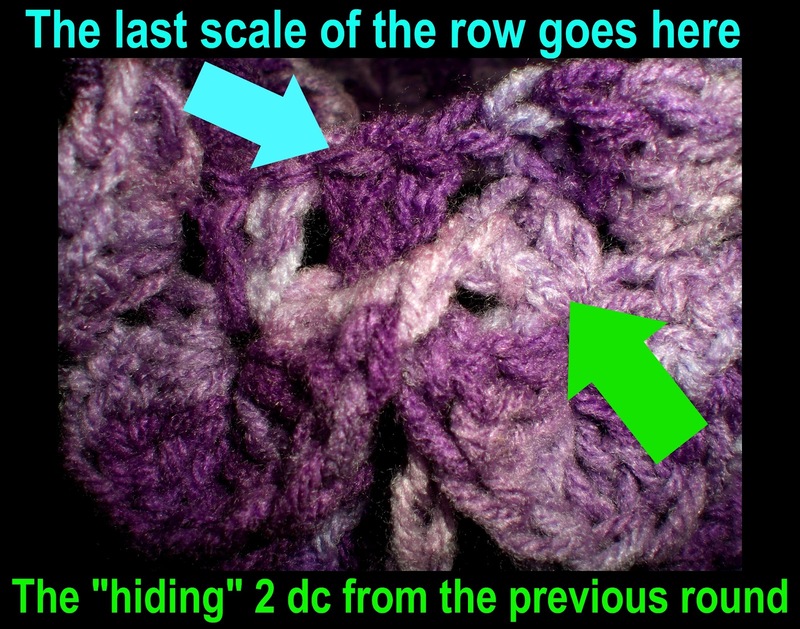 When you dc into the space between the scale and 2 dc: On the very first one in the round it will be very easy to see but as you go around you will have to pull back the scales a little bit so you can get to the chain spaces and stitches behind the scales...they hide back there. - -IF you don't work the last 2 dc into the chain space and sl st , join and fasten off at this point you would have yourself an awesome hotpad!!! Hmm.......idea! Space in between the 2 dc from the previous round: You will work 2 dc into the space in between the 2 dc from the previous round. Instead of working in the chain spaces like you did on every other round and skipping over the 2 dc you will be working in between those 2 dc. Work the 2 dc like this now and throughout the pattern unless otherwise specified. Count in the direction that you are working.....count 16 stitches from where your hook is and mark that stitch, count 10 more stitches and mark the 11th stitch. Count 16 more stitches and mark that 16th stitch. Make sure you do not twist the chain!! Repeat 5 more times. By the end of working the strap the 5 stitches on both sides where the "ears" were made have the strap attached. On the last row sl st in the last stitch instead of sc. Fasten off. I put a face on just one side of my purse, if you wish to have a face on both sides than make 4 eyes and 2 beaks. For the eyes you will want to make a flat circle. 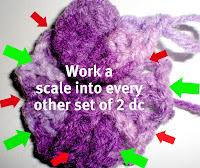 You wish to do the eyes differently (different hook size, yarn weight) just make sure it measures to 2 1/2 inches big. Rnd 1: 6 sc in 2nd ch from hook. Sl st in first sc, to join. Rnd 2: ch 1, 2 sc in ea sc around. Sl st in first sc, to join. Rnd 3: ch 1, * sc in next sc, 2 sc in next sc * around. Sl st in first sc, to join. Rnd 4: ch 1, * sc in ea of next 2 sc, 2 sc in next sc * around. Sl st in first sc, to join. Rnd 5: ch 1, * sc in ea of next 3 sc, 2 sc in next sc * around. Sl st in first sc, to join. Leave the tail long so you can use it to attach the eye to the piece. Sc in to the first ch twice. Flip/turn your work and ch one. Sc into each stitch of the last row, there should be 3 sc in this row. Ch one then again flip your work and sc into each stitch of the previous row, there should now be 4 sc. I worked a sl st into each st around the border...you don't have to do this if you don't want to. Personally I don't like the triangle beaks, I prefer a shape that is similar to a guitar pick. This bag needs a lining because of the scales there are holes in between so most likely some small items would fall out. I'm having trouble deciding the best way to line this bag. I wanted to have the pattern complete before I posted it but....I thought maybe it would be best to get some feedback on how to line this purse. I found a tutorial that instructs you to measure the size the width of the piece and cut out 2 pieces of fabric and sew the together down the sides, which I think seems like the best solution. I love shrugs! Leggings and a tunic with some added flair is a typical outfit for me so I love cute shrugs or vests to jazz up and outfit. I previously made the Simple Shrug by Lion Brand Yarn in black and I love it. 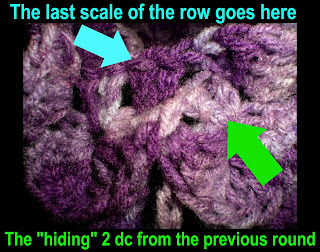 It's a simple pattern where you work up a big rectangle made of rows of dc's and sew together the sides to make a cozy shrug. I decided to take that idea and change it up quite a bit. I'm also working on a light and airy daisy motif shrug but that still needs some work (and blocking) so that one is soon to come.... but is sure to be a showstopper. 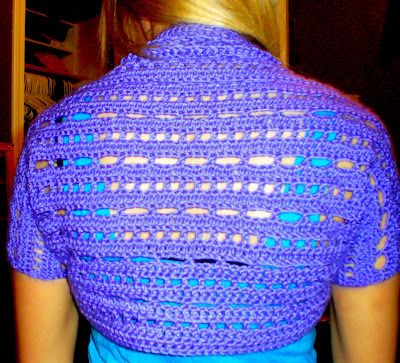 But for now we will just dive into how to make this shrug, I am so excited to share this pattern with you guys!!! I love the colors in this yarn! 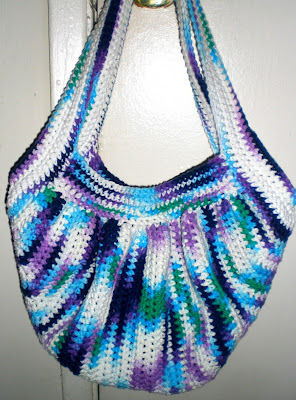 This is a great pattern to use a self striping or ombre yarn with. You could also take this pattern and make a small rectangle and sew the sides to make a cropped version like many other smaller shrug/boleros. This pattern may look slightly confusing but it is pretty simple I just would rather over explain that not give enough information. You can use any hook and size because you adjust how many sets you need according to the size of your sets. I recommend an H hook and medium worsted acrylic blend yarn but you can use what you like best. But be careful with cotton yarns because you want this piece to have some stretch and flow to it and cotton tends to be a little less flexible. How big is the button you plan on using? 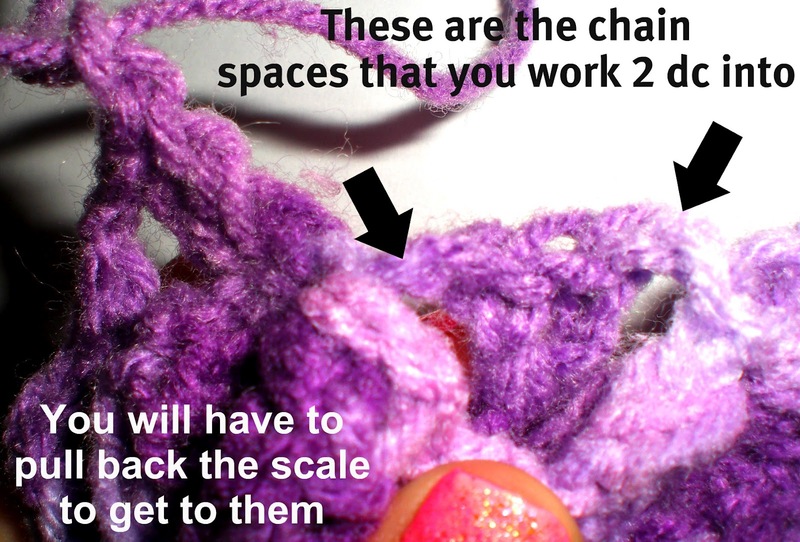 This is very important when it comes to how many to chain for your button hole. I recommend doing a quick small square of hdc using the appropriate ch size (below) for your button you make sure it fits through but doesn't have to much space to where it will slip out. 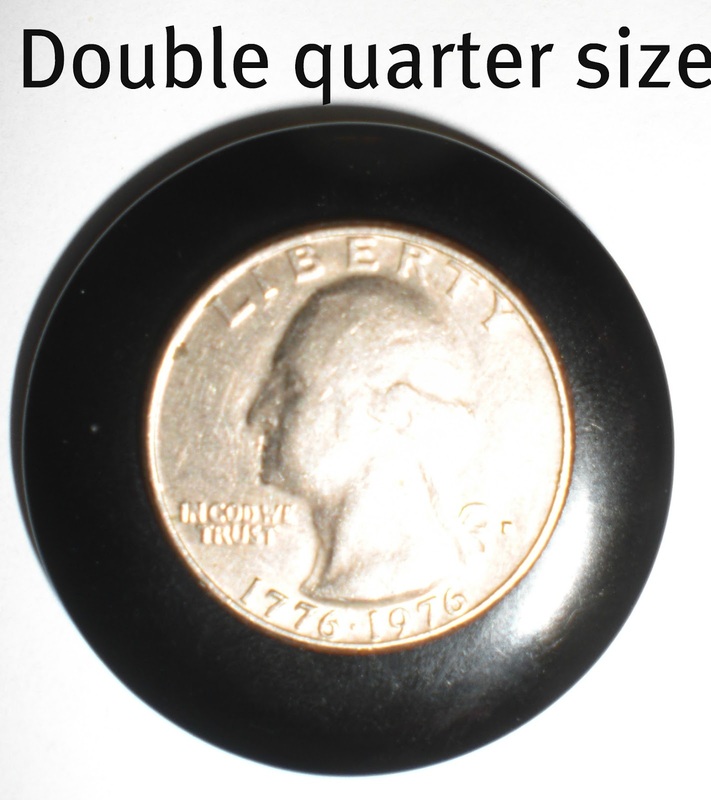 The button I used is the double quarter size (double the size of a quarter), as you can see in the example pictures. You need to determine how big to make the rectangle for your shrug. Grab a measuring strip, a pen and paper. Determine the middle point between your elbow and shoulder, now go about an inch above that. That is what I am going to refer to as the top of your arm. #1. Measure from the top of your arm spot across your shoulders to that same spot on your other arm. Write that measurement down as #1. #2. Measure from the top of your shoulders down your back to about 5 inches above where you want the piece to stop. (the band will accommodate for those extra 5 inches) Write that measurement down as #2. #3. Measure from the top of your shoulder down to the top of your arm spot. Write that measurement down as #3. You will need to determine how many "sets" you will need to achieve the size needed according to measurement #1. Each "set" is made of 5 dc's + ch 1 space. Do a test strip with your yarn and hook of choice. Measure the length of your set, you don't need to worry about the height of the set. I used a H(5mm) Hook and worsted weight yarn and my "sets" are each 2 inches long. For example, on my shrug I put a total of 10 sets + the last 5 dc's so the piece is 21 1/2 inches wide. The reason I'm making it confusing with the sets is so you can use any hook size and yarn you choose without it affecting the size of the garment. Ravelry page for the Kush Shrug - Add it to your library! Do not tie off! But you do want to weave in the end from the beginning. Once you finish making your piece lay it flat and take the side with the yarn still attached and fold it over according to however many inches you have for measurement #3. Make sure it is even on both sides, mark that spot on both sides. Ch 2, turn so your are working across the top/neck/short side work hdc into each st across when you get to the end sl st into the other marker stitch to join. From here on out you will be working in rounds. Stop and try on the piece, while you have it on locate your "solar plexus"/celiac plexus, that's the area where your ribs come to a v in the center or your chest...right in the middle near of the bottom of your boobies. 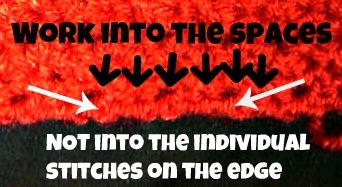 Pull both the sides together so they meet up at your plexus, that is where you will want to put the button. You may have to tug on it a bit to get it to meet which is normal because the piece will stretch more once worn. If it is too tight and you cannot get it to meet even when stretched a bit than do a few more rows of hdc. Mark those stitches on both sides but make sure they are even. It is helpful if you mark them then take off the piece and count the rows from the bottom up so you are sure they are even. You can either add just one button (like I did), add 2 buttons or add buttons all the way down, whatever you prefer. 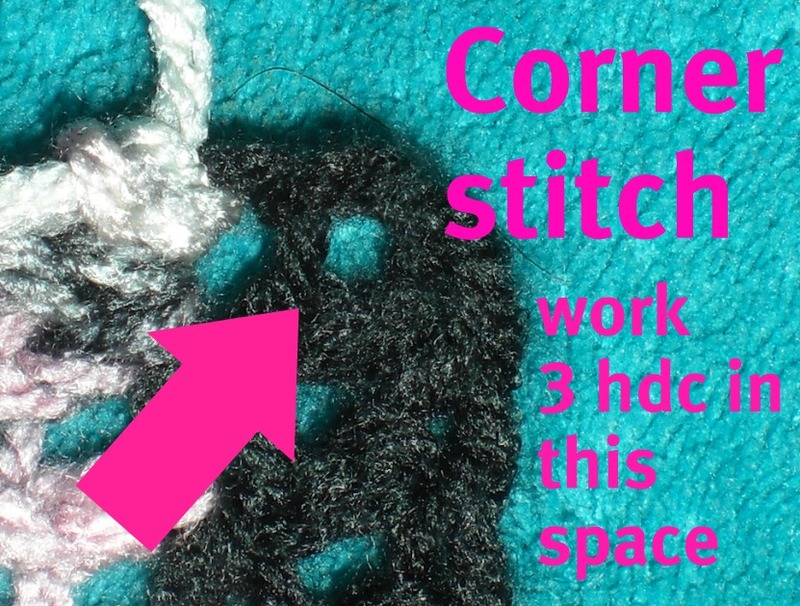 whichever depending on your button size then hdc into the next stitch and continue working around, when you get to the next marker just keep going but leave that marker in that spot to refer to later. at the end of round sl st to join. 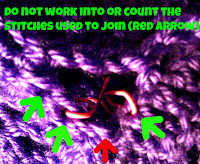 Attach the button in the stitch that you marked earlier. weave in all the ends and you're done! The "Fat Bag"...Even Fatter! My new favorite purse! Ever since I first learned to crochet I have seen pictures of this awesome purse that I knew I wanted to make, unfortunately when I went to find the pattern I found a chart or instructions in a language I don't understand. Luckily after some searching I found this great tutorial by Bend Beanies on how to make the "Fat Bag". 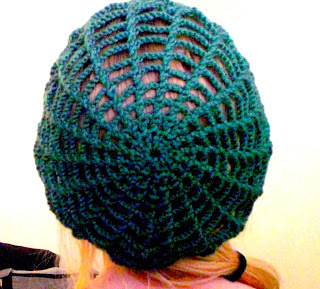 The chart is the original design, "Bend Beanies" edited the pattern by adding extra rows. The first one I made I made was according to Bend Beanies edits. I was happy with it but I personally like a very deep purse and I felt like my stuff was going to fall out of it if I bent down so I sat down and figured out how to make it the way I want it. I sketched it out and worked it up and I am extremely happy with the results. The first day I was wearing it I was at JoAnns and got complimented by some fellow crocheters in the yarn isle! One thing that I think made my purse pop was that I used 2 different ombre yarns. Both were Lily's Sugar and Cream and both had 2 common colors. 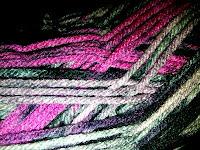 (shades named Moondance & Beach Ball Blue) I switched the yarns after every 2 rows. The common colors of these 2 yarns were white and light blue. 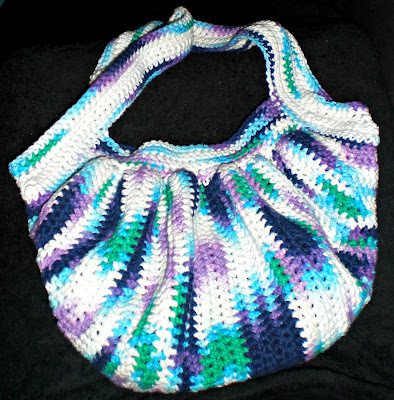 I highly recommend using Sugar and Cream because they have a great selection of self striping/ombre yarns and the stiffness the cotton provides is perfect for this purse. 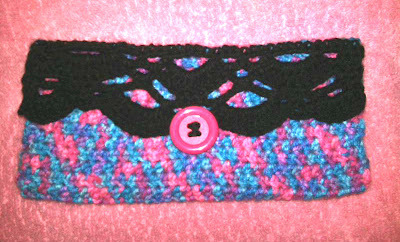 I added a few rows of just white cotton in the middle rows of the strap so it has colored "borders". The changes I made are simple, normally you start by working 5 hdc on each side of the increase and stop increasing at 18 on each side. With my edit you start with 7 on each side of the increase and stop increasing at 24 on each side. The other change I made is that when you are working the straps you work some decreases. Ravelry page for this fatter fat bag - Add it to your library! I had an old Ed Hardy scarf that I was able to upcycle it and use it to line my purse, which I think is a great compliment to the other colors. I highly recommend lining this purse, you don't have to but I think you should. 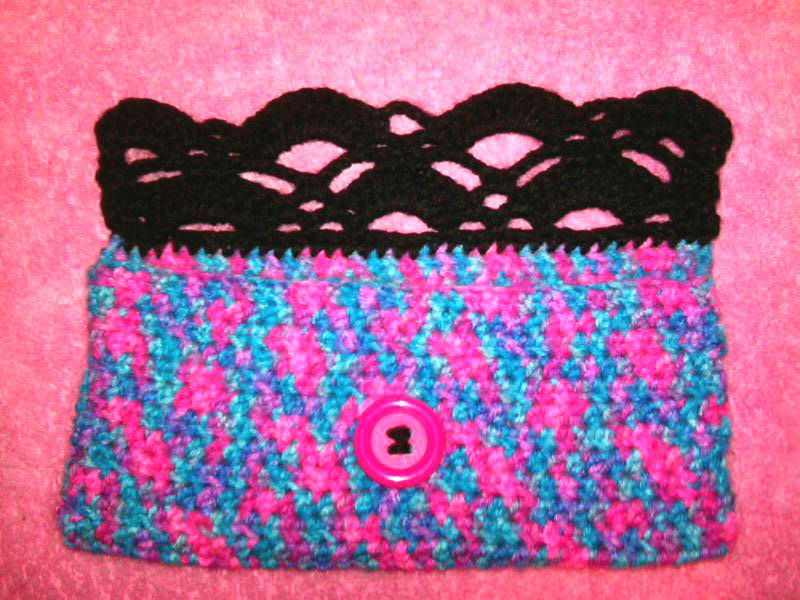 The Bend Beanies tutorial is great for lining the purse and starting the band and straps so use that. They provide lots of pictures and a great detailed explaination. But remember that you want to really squoosh the piece together and do the first band row (working into the turning chains) tightly.. the tighter the more the pleats will stand out. Their directions are correct..do not do that row loosely! So pop over there and then once your ready to do the first row on the straps (after you've done the chains) you can follow the direction below. After you've worked up the "band" and started the straps by working the chains and now you're back to where you first attached the yarn for the straps. 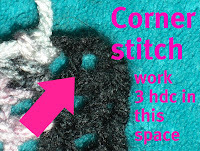 Find the 5 stitches that were worked in the middle between the increases/decreases and mark the stitches next to them so you can use these 5 stitches as a reference for the center. I'm am making the transition from making a bunch of scarves and beanies to leaping into spring with some cute colorful berets and shrugs. Check out those colors! I love the different shades of green and pink. It just screams spring! I really wish I had a better camera so you could see this hat better!!! I am in love with this pattern, it's so light and airy and it looks awesome with this multicolored yarn. I used Caron (my favorite brand) Simply Soft Paints in the color "Rose Garden". 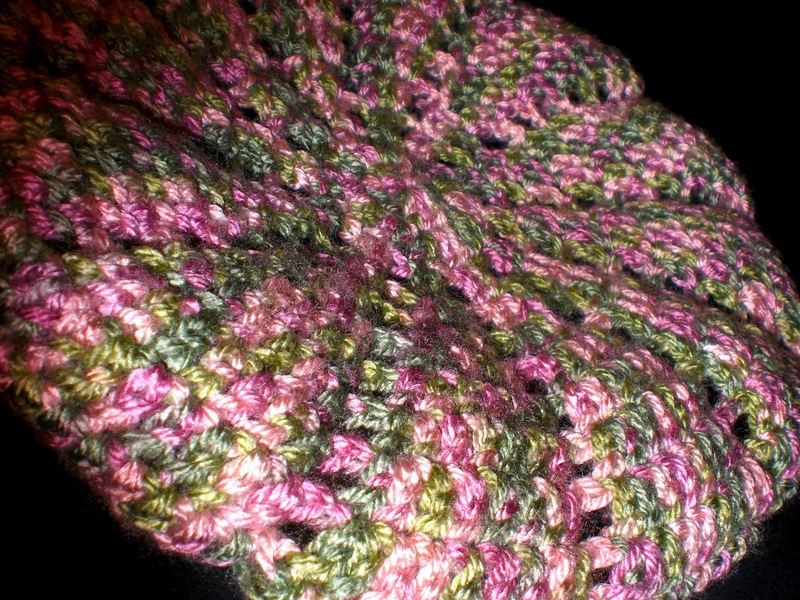 I love this yarn, it is the same one I used for the puff stitches on my Pretty Puffs hat and scarf. 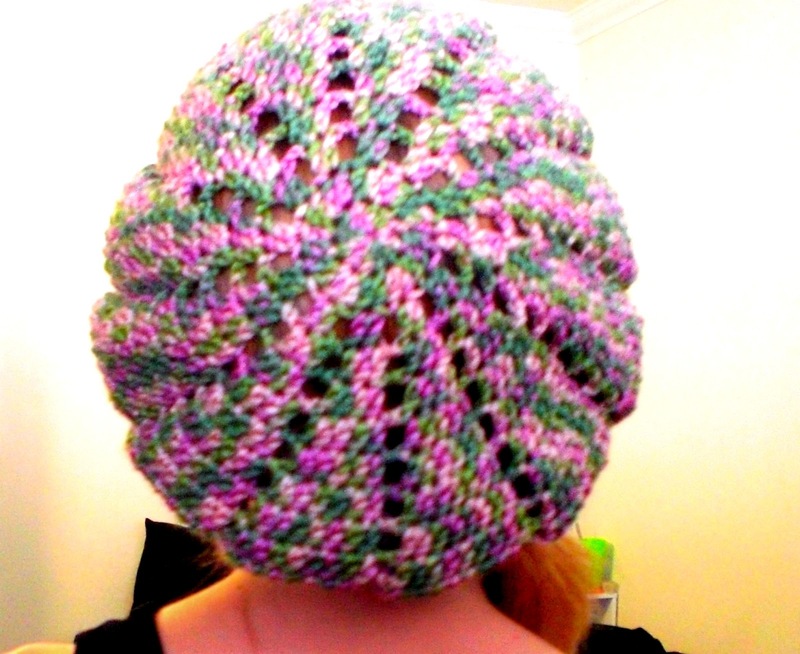 It is the perfect yarn to use because it has so much stretch to it which you want for this hat. This is a free pattern that is offered on Ravelry, it is not my pattern. 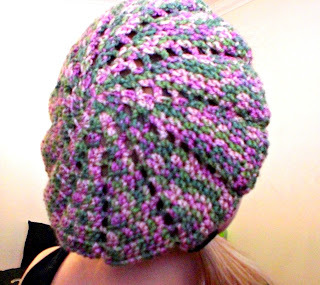 I suggest trying this pattern out with some light and flexible yarn for optimum "slouchyness" (my new word). This hat works up very very quickly. It took me only 1 1/2 episodes of Grey's Anatomy and I was done! So get to it hookers! When life gives you lemons, you make lemonade right? Well I've been feeling a little sick this week so while I was letting my body rest I kept my mind and hands busy. I made 3 hats and 2 of them are my own creations. I will take some pictures of the other ones and post them asap. They came out really awesome, luckily when I'm just messing around I usually write down the steps just in case. Pretend that the ring is closed, I tried on the hat and took this before I finished off and it ended up being the best picture of it with my crappy camera. This hat would be good for a spring or summer hat. Who says hats are supposed to be "warm"? I recently was making Red Hearts free pattern for the Lighthearted top (It's hibernating right now) and a friend said that it looked like a spider web and that it looked really cool. 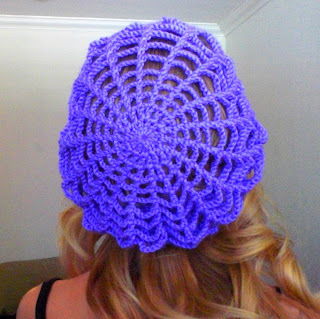 I got to thinking that it would be cool to make a light airy beret with a web type pattern...and this hat was born! The band measures 22 inches around. If that is too small for you than you than in the "decrease round" work 16 sc between each sc2tog instead of 13. It is a very flexible pattern and you can easily see how you could add more rows onto the pattern before you work the decrease rounds. Add this hat to your Ravelry library! You need to know how to make an adjustable ("magic") ring. Note: You will need to go into the top of the dc's from the previous round. Do not work the chains too tightly, your piece will end up smaller than the intended size. You want the hat to have stretch and flow to it so don't make stiff tight chains. Since chains form most of the hat if you are a tight crocheter than you might want to go up a hook size!! I cannot stress enough that how tight you make your chains will determine the size. 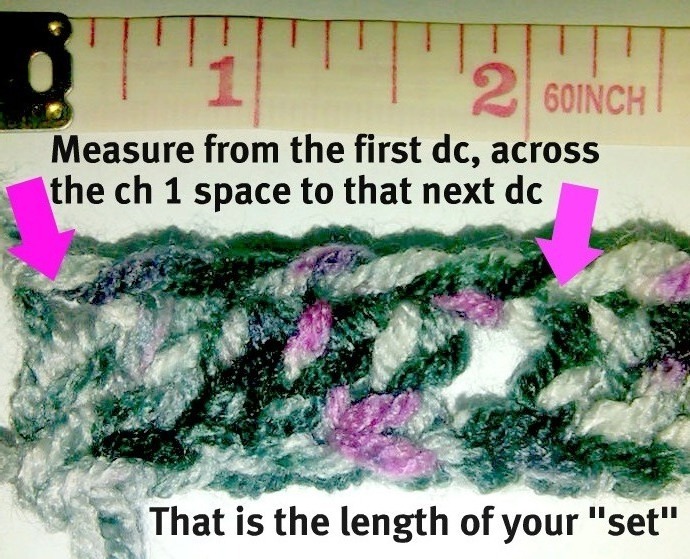 If it is too small keep increasing stitches before you start the decrease! Each yarn will be slightly different so please be prepared to improvise steps if your is too tight/loose. Unfortunately because of the variables I cannot be held responsible for some hat coming out smaller/larger. Please use your best judgement. - Ch 5, *dc into top of dc from previous round, ch 2. * Slst into the 3rd chain. - Ch 6, *dc into top of dc from previous round, ch 3. * Slst into the 3rd chain. - Ch 7, *dc into top of dc from previous round, ch 4. * Slst into the 3rd chain. - Ch 8, *dc into top of dc from previous round, ch 5. * Slst into the 3rd chain. - Ch 9, *dc into top of dc from previous round, ch 6. * Slst into the 3rd chain. - Ch 10, *dc into top of dc from previous round, ch 7. * Slst into the 3rd chain. - Ch 11, *dc into top of dc from previous round, ch 8. * Slst into the 3rd chain. - Ch 12, *dc into top of dc from previous round, ch 9. * Slst into the 3rd chain. This is where you will start decreasing. If it seems a little too small still just keep increasing! Theres no major rhyme or reason to the pattern of decreasing back down so don't get intimidated that there wont be exact steps. Use the information at hand to guide you. This pattern was designed to be something you can easily adjust to size. I am so amazed by the feedback and attention this hat got, quite a confidence boost for a newbie :) Thank you guys so much and I'm really glad that so many of you enjoy this pattern! I am a 20-something woman who lives in Northern California, I'm a lucky lefty. I love anything where I'm working with my hands. I love cooking/baking, drawing, painting and everything under the sun. I have an intense passion for music, but I can't play an instrument or sing very well but that doesn't stop me from singing out loud 24/7. I have another passion for fashion, but that doesn't mean I spend lots of money on it! Hence, frugal fashionista :) By the way, sorry for putting ads up here guys but a girls gotta do what a girls gotta do to make her rent...right? Thanks for understanding, every penny counts. I am all about free patterns and sharing them for fun. 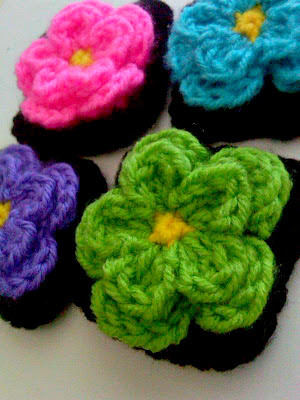 You are welcome to sell any items made with my patterns, please credit me by putting a link to my page. As I stated earlier I have no intention of ever making you purchase the patterns, because I know that not everybody can go around paying $4.00 for a patten. 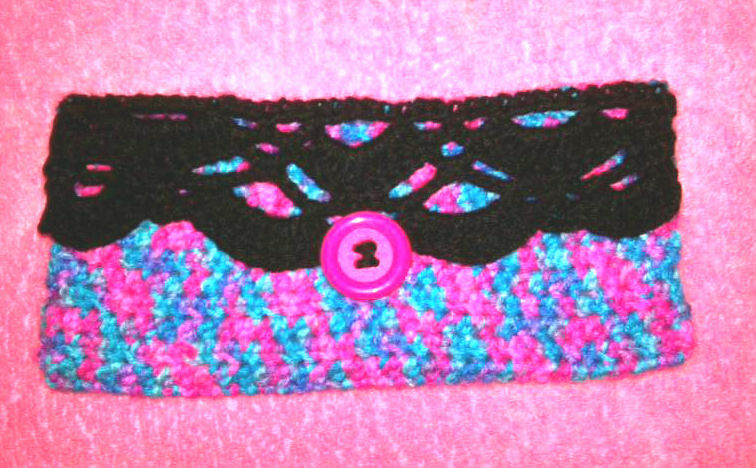 That is why I offer all my patterns for free so it would be greatly appreciated if you could spare a $1.00 or $2. You can find the Paypal button at the top of the page. Bolero / Shrug to Match the "Perfect Purse by Lion Brand Yarn"
I offer all my patterns for free and you are welcome to sell your items made from my patterns. All I ask is that you could please send a few dollars my way, if you can spare it. It would be greatly appreciated since I do not plan on ever making anybody purchase the patterns, I know that not everyone (myself included) can afford to purchase patterns. 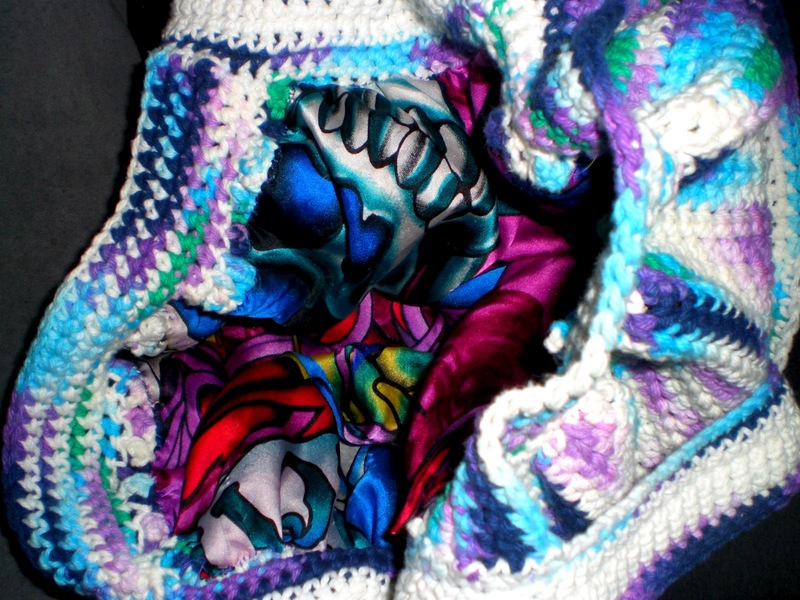 I do dedicate a lot of my time to providing these free patterns and hunting down other awesome free ones. If you are able to help me raise some funds than please click on the "buy now" button(couldn't use a "donate" button since I'm not a charity organization) If you are able to help me out than I will not be able to thank you enough, every penny counts for me! There are sooo many times where I have a great idea for a new pattern but don't have the money to buy some skeins of yarns so every dollar really helps.